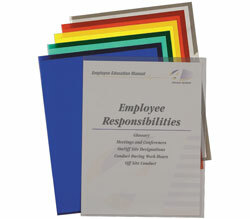 2-pocket paper folders with laminated, high gloss finish. 2-pocket paper portfolios/folders with 3-hole punch hold papers and resist tearing. Laminated, high-gloss finish catches your eye. Vibrant colors let you organize by subject, project and more! Great for school, home or office. Folders feature 3-hole punch with 2 business card slots. Without prongs. For 11 x 8 ½ document storage. Assorted colors include Bright Pink, Yellow, Orange, Blue, Lime Green and Purple. Minimum purchase quantity is 100 units (one display).